Google Fusion Tables is a very good modern data management web application.This is a new application from Google and still in the experimental phase. 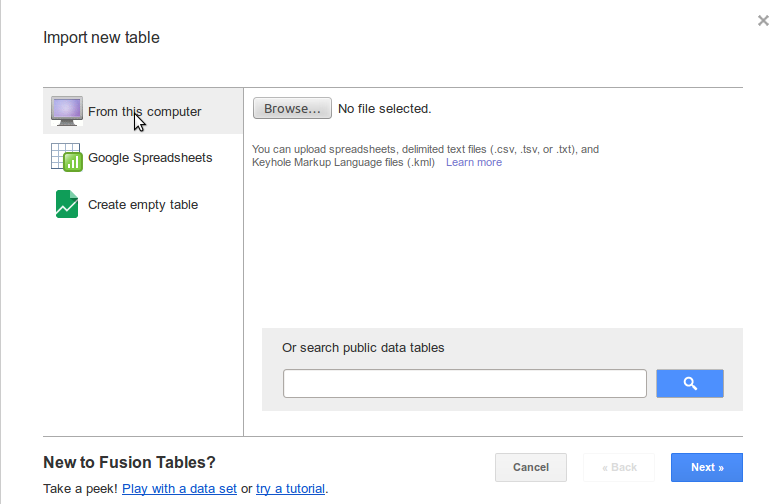 Fusion Table could be integrated with other Google tools, e.g. Google Doc, Forms, Spreadsheet, etc. and added to Google Drive and data can be imported from those tools or online into Fusion Table. 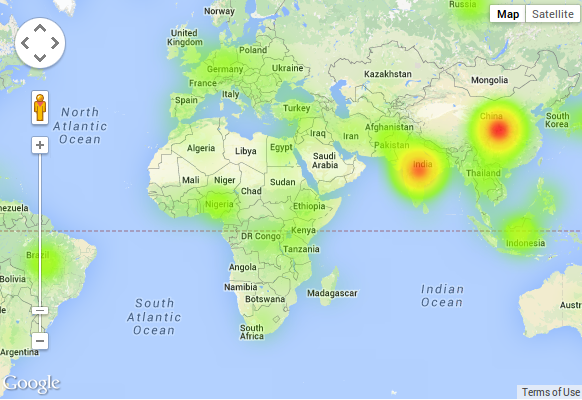 Let's try this new tool and create simple Heatmap with our data. Heatmaps display colors on the map to represent the density of points from a table. 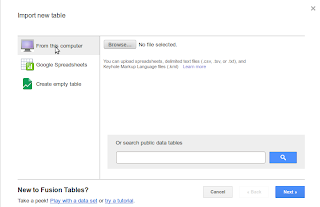 TIP: Google Fusion Table can be accessed under Google Drive. But first you need to add this option to your Google Drive. 1. Go to Fusion Table and click Open. You can add data from Computer, Google Spreadsheet or just paste the link with data from Internet. That's really cool! 2.Now you need to Geocode your data, or merge your data with other geocoded tabel, remember that each City, Country Name or ISO Code must appear in both files. TIP: There are daily limits on free geocodes in Fusion Tables . Fusion Tables can only geocode up to 2,500 requests per 24 hour period. 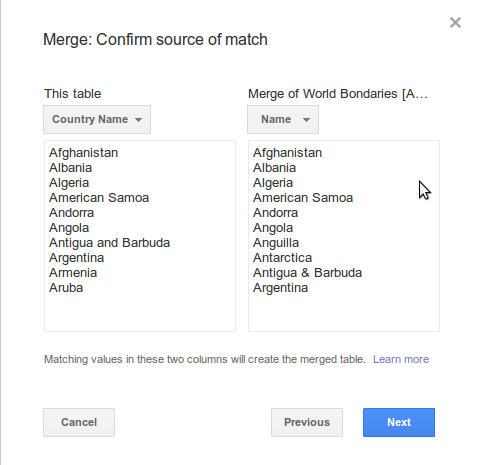 So it's easier and faster to merge two tables. Also Heatmaps of geocoded addresses can be viewed in Fusion Tables but cannot be published. 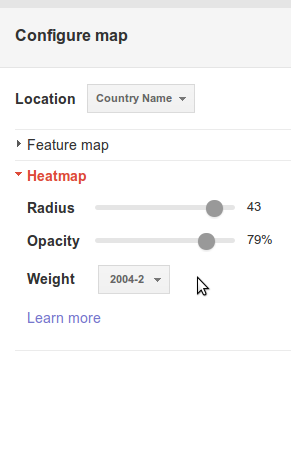 Publishing would extract the geocodes, which is not allowed by the Google Geocoding API's usage limits. But you can always use this public table, properly geocoded in KML Format. 3. So we will merge our data table with the geocoded table. In the main menu, select File and Merge. Remember to confirm the source of the match, which means to select the correct data columns that are common to both tables. 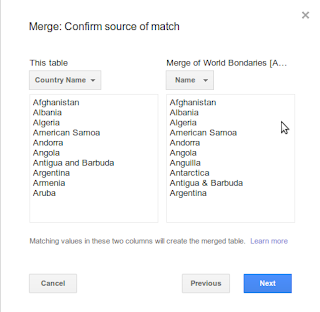 In this exercise, go to the right-hand World Boundaries table and select “Name” to match it up with the “Country Name” column of the World Bank spreadsheet data, as shown below. 4. 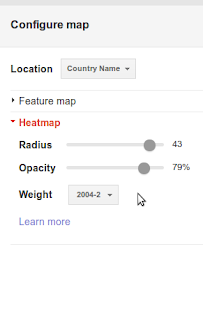 Open new merged table and click on Map tab and then on Heatmap in right menu and chose data set to visualize on the map from drop down menu Weight. 5. Now we can add some styling to the map to create an interesting visualization of the data. Play with Radius and Opacity to find best. TIP: The Radius slider sets the radius of influence in pixels. Higher values result a smoother appearance. The Opacity slider controls how transparent the heatmap colors are. And the optional Weight column adjusts each point's importance by multiplying its intensity by the specified column value. 6. 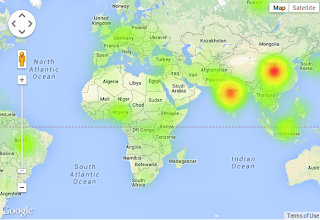 Finally publish your new Heatmap. Go to Tools and Publish and copy link or Iframe code to embed into website or blog.